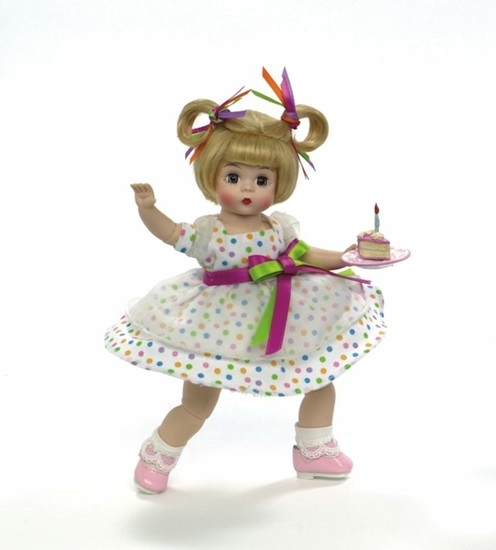 New in 2013, this is an 8-inch blue eyed, blonde haired fully articulated Wendy..
From the 2013 Special Occasions Series by Madame Alexander, we are pleased to share "It's Your Birthday, Eat Cake!" This is an 8-inch fully articulated Wendy with blue eyes and high, blonde pigtails with bangs. She is wearing a white with multi-colored polka dots dress. The dress features short, puffed organdy sleeves, a white semi circle overlay and a multi colored bow at the waist that matches her hair bows. White step-ins, white lace trimmed socks and pink Mary Jane's complete her celebratory look. A slice of cake topped with a birthday candle accompanies this little party girl. She is perfect for ages 14 and up.